Colourful Dream was named Gammill Best Wall Quilt at the first Fall Paducah contest. When I saw the new contest offer in Paducah on my desk, I told my husband, I hadn’t participated for a while in a quilt contest. I told him if I had an idea I was going to do it. Within five minutes I sat at the computer and saw an elephant and from that moment I knew exactly what I wanted to do. I call those quilts, quilt of divine inspiration because of the strong inner knowing you feel inside that is the right thing to do. I knew, deep down, that it was important to bring it to finish. I knew I wanted to have a mosaic effect but wanted to create some depth at the same time. I didn’t know how to go about it, but I was patient about letting the inspiration guide me along the way, which is the key when uncertain. Patience is gold. I knew what I had to do next but waited for the inspiration to tell me the “how”. I could say it was meant to be. Colourful Dream measures 32” x 48”. 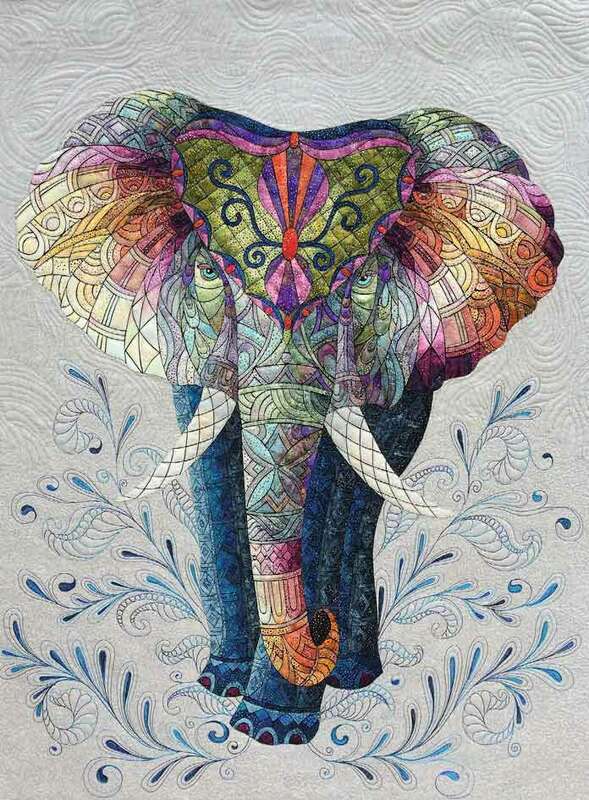 Batik fabric was used to create the elephant and grey linen was used to make the background, which is sturdier and a good support for the weight of the many layers of fabric to make the elephant.